A devotional song sung by Neha Vaishnav, Sandeep Batra and Monty Sharma starring Ashwini Kalsekar, Amita Pathak, Ayush Mahesh Khedekar. The video of this song is available on YouTube at the official channel Zee Music Company. This video is of 2 minutes 23 seconds duration. 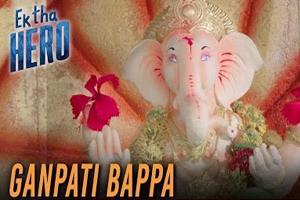 Lyrics of "Ganpati Bappa Morya"
Lyrics in Hindi (Unicode) of "गणपति बाप्पा मोरया"